February 2019: Earlier this winter AJ asked me to keep an eye out for a decent used sled for him to purchase for the upcoming annual Winter Cabin Trip, budget $1000 or less for machine & repairs. 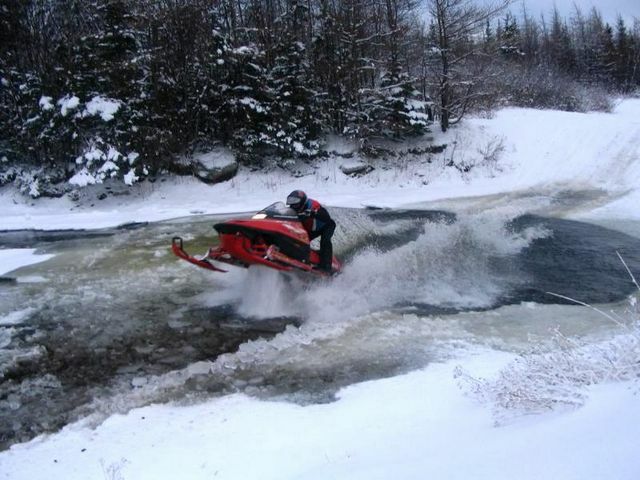 I spied this familiar looking beast for sale on NL classifieds one day listed on the Burin Peninsula, a 1997 Yamaha Vmax 700 triple. A quick look at the pics confirmed that this was once owned by shed-headz crew member Bill Hillyard, he parted ways with it in 2006 having upgraded the previous winter to a 2005 Yamaha RX-1. 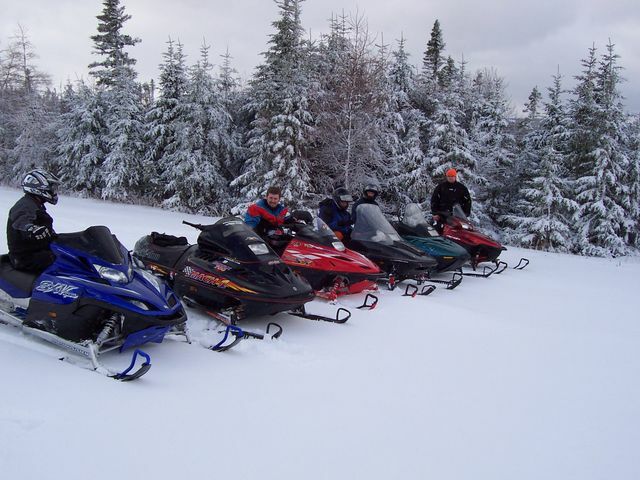 The sled needed some serious front end work, but it seemed do-able and the price was right so AJ and Ronnie headed down the Burin Peninsula and came home with the beast for a solid good deal. 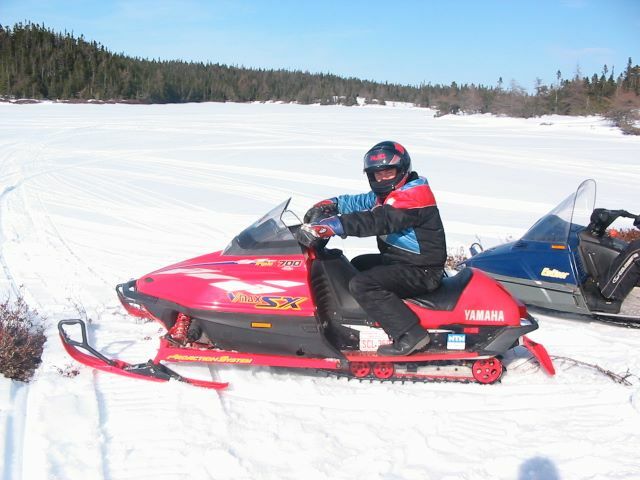 Quick History: Bill purchased this sled brand new from Metro Equipment and logged about 5000 kilometers over approximately 9 years of ownership. Many of those early kilometers were logged ice racing, uphill drag racing, in the air, and on open water! Bill's sled was the very first snowmobile I ever rode and inspired me and many of our crew to purchase a sled and truly enjoy the sport way back in the early 2000's. This was also the very first sled on which AJ as a young boy was taken for a ride along. January 2005 rip in the Goulds. Everyone in the crew always loved the unique and amazing sound of the Yamaha triple 2-stroke, there is nothing else quite like it! Back to the Build: All in all this is a pretty damn cool sled to have back in the shed-headz crew. The last owner really did a number on the front suspension bending up two trailing arms, snapping the upper left radius rod clean off, a broken front shock, snapped sway bar end link, two bent trailing arm mounts, a broken taillight, broken front bumper and 2 broken skis (he did throw in 2 used Kimpex plastic skis with the deal). However the sled did start easily and run amazingly well. The main chassis of the sled is in great shape and straight, the rear skid is undamaged, track is in OK shape, no major tears in the seat and no major cracks in the hood. The few small cracks in the hood actually date back to Bill's ownership! The engine itself is in good shape and still sports many of the mods installed by Bill back in the day including reed spacers and a shaved head gasket. One of the recent owners cut open the muffler and apparently removed most of the baffles but the sled still sounds great without being too obnoxious. Night one of working on the sled found Bill himself on site to assist with repairs beginning with the removal the air box & carbs for inspection and cleaning. The carbs were immaculately clean a testament that the sled had been looked after at least up until the last owner and properly stored. When Ron & AJ picked up the sled the carburetor boots between the carb & air box were missing but were later found in the seat trunk of the machine. Boots between the carburetor & engine are critical and have to be in perfect shape to prevent unmetered air leaning out the fuel mix and burning down the cylinder. The boots that were missing on this machine are less important and are mainly needed to keep unfiltered dirty air out of the engine. Bill reassembled the air box properly with all carb boots and clamps in place. 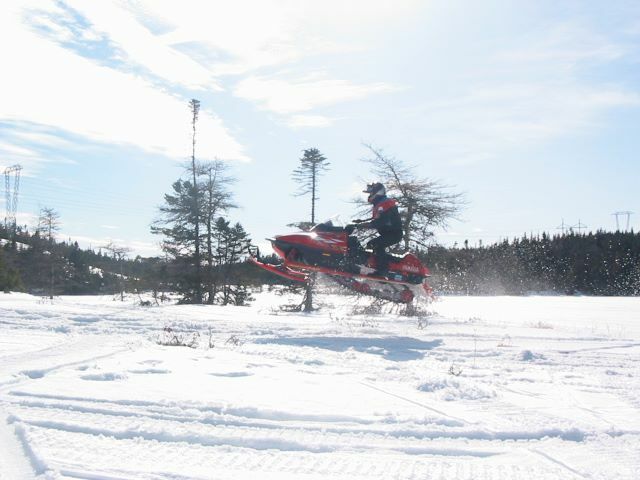 This sled originally came with non-reservoir front shocks, an owner at some point upgraded them to 1998 Ohlin's remote reservoir shocks, however the last owner broke one during one of his crashes. AJ locally sourced a used non-reservoir OEM Ohlin's shock to get the machine back on the snow. 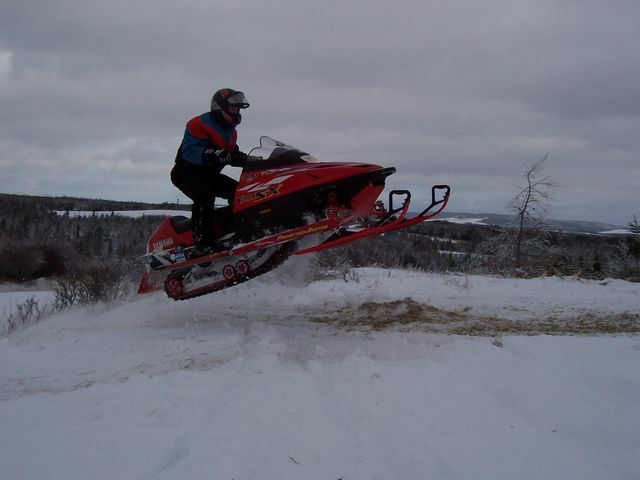 A front bumper is important on a sled not only for protection but also as a lifting point particularly if you get stuck. Unable to source a good used one in time, Ronnie came up with this repair. He removed the bumper and slid a piece of proper size square stock inside. He then slid the other broken piece over the square stock and bolted the bumper back on the sled. He finished the job by wrapping the piece in gorilla tape, then hockey tape making for a decent looking, strong, functional, temporary repair. Next up was the start of front suspension repairs. The ski and ski leg were removed and bolts holding the radius rods, shock, sway bar were unbolted and lastly the rear trailing arm bolt removed. New parts in stock and ready to go. The new trailing arm was pretty straightforward to replace. Bill and Janes straightened out the rear trailing arm mount which had been pushed back quite a bit then fixed up the running board as best they could. The hardest part of the job was pressing in the rear trailing arm bushing, more pics on that below. The replacement radius rod is on order, and other than the shock this side is nearly complete. The Kimpex skis weren't a perfect fit but they will do the job and actually look decent. The right side trailing arm was bent up quite a bit worst than the left, to make the job easier Ronnie cut the bent up arm in two pieces. Ronnie's poor vise got a workout pressing in the OEM rear trailing arm bushings into the new trailing arms. We sanded paint overspray from inside the joint on the new arm, cleaned up the bushing, froze the bushing, heated the trailing arm, lubed the parts and it was still quite a workout to get the bushing pressed in. With the bushing installed, Janes, AJ and I got the right side trailing arm installed on the sled while Ronnie set about fabbing up new ski rods for the Kimpex skis. A family friend donated a set of brand new ski rods he had lying around to the project, all Ronnie had to do was cut them to fit the Kimpex skis and weld on new mounting studs. The new ski rods fit perfectly and will make steering pretty decent on this sled. During the impact with whatever broke the front bumper the hood hinge support bracket took a smack and was kinked up causing the hood to not align with the lower bodywork. I came up with this setup while working on Maffer's bent tunnel a couple winters ago, it consists of a strong straight bar (in this case 1" square stock) and a couple C-clamps working back and forth across the affected area to press it back into shape. It's simple and works great. I also applied it to the running boards where Bill & Janes straightened out the rear trailing arm mounts to make the floor board nice and flat. Next up Ronnie, AJ and I fabricated two steel reinforcing plates (one per side) to bolt down through the running boards to the rear trailing arm mounts sandwiching the torn aluminum in between. This will provide cheap, effective reinforcement for this damaged area. We drilled out 4 of the OEM steel rivets replacing them with steel pan head bolts and locknuts. The radius rod ordered at Atlantic Recreation didn't arrive in time so Ronnie tried his hand at welding the chromoly OEM radius rod with great success. The weld penetrated well and survived the cabin trip! One of the last steps of the build was to tip the machine over and grease all rear suspension points as well as the two front suspension points with quality Yamalube. Lastly the bent up hood hinge was straightened up by French & Sooley then bolted back in place making the machine ready to go for the annual winter cabin trip in a couple days time. Ronnie and AJ were the first to arrive at the cabin Monday evening and took advantage of the early snow (that was forecasted to melt Tuesday night with rain & warm temps). The sled ran & worked great, after quite a few rips up the pond the drive belt of unknown age let go, likely due to age and dry rot. Ronnie called the crew for technical support and had the spare belt installed in short order. The old Vmax ran great for most of the week, but by the last day it started bogging after wide open pulls up the pond. The sled wasn't overheating, it seemed spark related so the spark plugs were replaced, one plug cap tested defective so all 3 were replaced but the problem persisted. Ronnie & Bill are currently troubleshooting the sled to see if its ignition coil, clutch or fuel delivery related.